On Thursday November 8th, 2018, more than 52,000 people’s lives were changed forever. Northern California was rocked by a wildfire that consumed thousands of homes and businesses. Wildfires In the United States are mainly concentrated in the Western forests (National Geographic, 2018), where wildfire activity, frequency, severity and size are seeing an increase in recent years, and is expected to further increase in years to come (Van Mantgem, Nesmith, Keifer, Knapp, Flint, Flint, & Penuelas, 2013 and Riley & Loehman, 2016). Climate change is the main driver of this trend (Abatzoglou & Williams, 2016), and as wildfires increase, so do the damages they inflict on natural, economic, and human resources (Barrett, 2018 and Kousky, Greig, Lingle, & Kunreuther, 2018).The cost of wildfires are buoyed by the additional factors of under-burned forests as a result of too much fire suppression, and the rapid encroachment of human settlement in areas bordering forests, known as the wildland urban interface (WUI) (Moseley, 2018). Due to the increasing activity, size, intensity, and severity of wildfires and their associated costs in the Western U.S. and particularly California, a well-funded, rigorous regime of prescribed burning should be implemented at federal, state, and local levels in order to cull accumulated forest fuels, and thus decrease future wildfire severity and intensity. An ever-growing US population has inevitably resulted in the need for more living space throughout the country. This consistent expansion has led to many towns and cities creating a Wildland-Urban Interface (WUI). The WUI is known as the area where structures and other human development meet or intermingle with undeveloped wildland, and is where wildfires have their greatest impacts on people (Martinuzzi et al. 2015). When studying WUI growth nationwide, researchers found a 33% increase over a 20 year period, which broke down to a 41% increase in new housing – from 30.8 million homes in 1990 to 40.1 million homes in 2010 (Martin, 2018). The WUI is a key factor in the issue of wildfires affecting the US population. Many elements of development into rural areas, specifically forests, contribute to the risks that are tied to the presence of the WUI. Aspects of living such as gardens and greenery, deforestation and altered ecosystems all have the potential to increase fire risks (Martinuzzi et al. 2015). This has proven to be a deadly situation for many people living in wildfire-prone areas in the last few years. According to a 2017 insurance analysis, 4.5 million American homes were identified as being at high or extreme risk of wildfire, with over 2 million of those homes being in California alone (Samanta, 2017). That same report estimated that the US suffered 5.1 billion dollars in losses due to wildfires during the past 10 years (Samanta, 2017). In the recent California Camp fire, 8,800 homes have been destroyed, with the fire being only 70% contained as of November 20th (iii, 2018). Wildfires do visible damage to property, but they cause even more damage to human life. The North Bay fires that occurred in October of 2017 claimed 43 lives, making it the most devastating wildfire in California’s history as of that date (Dobuzinskis, 2017). Unfortunately, that data was just surpassed with the recent Camp fires and Woolsey fires that both occurred on November 8th, 2018. 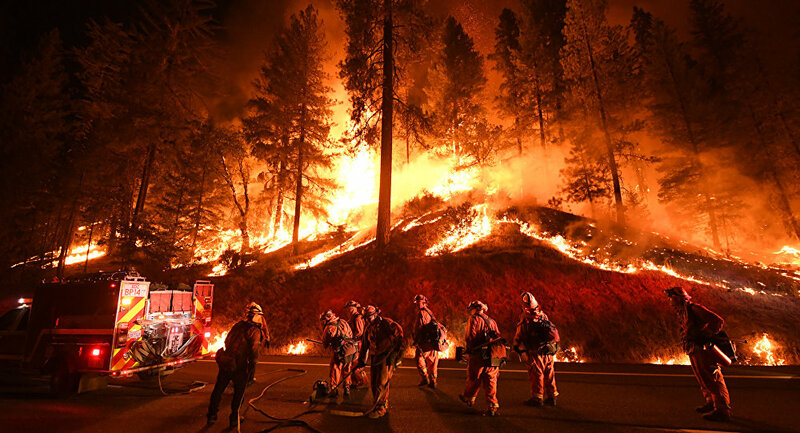 The Northern California Camp fire, which resulted in a death toll of 88 people, now holds the title of the deadliest California fire (Hatufa, 2018). The immediate danger of wildfires becoming larger and more severe brings with it concern for human life in terms of evacuating in time. For the Thomas fire that occured in Ventura County, California, over 27,000 people were forced to evacuate their homes. People died from not leaving in time, or by being trapped by the flames on their way to safety. Unfortunately, people can die from fires without being directly involved with flames. In 2009, the CDC stated that “the majority of [burn injury deaths within the home] occur as a result of inhaling smoke and toxic gases as opposed to burn injuries” (CDC, 2009). Smoke inhalation can kill people who haven’t yet come into contact with the fire itself. Another factor of health that is negatively impacted by wildfires is the long-term effects of the smoke created by these events. Unlike a typical bonfire which is very small and contained, wildfires become acres long and can cover an incredible amount of land, with flames also reaching much higher into the atmosphere. The smoke created from these large-scale wildfire events can reach people in regions otherwise unaffected by the original fire. Scientists discovered that smoke from a blaze in Northern Canada reached areas as far as North Dakota, South Dakota, Minnesota and Iowa (Nolen, 2016). This leads to a host of other problems for human health, mainly concerning how the presence of smoke pollution will affect communities in the long-term. Just like scientists advise against getting second-hand smoke from those who use cigarettes, the risks of wildfire smoke are just as dangerous, if not more. Within wildfire smoke are tiny solid and liquid pollutants, called particle pollution. These microscopic materials are no bigger than one third the diameter of a strand of hair (Nolen, 2016). They easily and unknowingly enter the lungs through normal breathing, and lodge themselves there. This creates a possibility for various respiratory problems to occur, both presently and into the future. Systematic reviews concluded that a positive association existed between exposure to wildfire smoke or wildfire particulate matter (PM2.5) and all-cause mortality and respiratory morbidity (Cascio, 2018). The term respiratory morbidity can include illnesses such as asthma, bronchitis, pneumonia, and chronic obstructive pulmonary disease (COPD). These illnesses are especially dangerous for people who are immunocompromised, such as the elderly, young children and people with pre-existing conditions. With this research bringing forth more ways that the presence of wildfire smoke is a danger to human health, the issue of growing wildfires should be regarded as a top-tier public health crisis. Poor land management and development into fire prone areas has also contributed to this issue, both escasterbating the potential for wildfires and increasing the human impact of these fires. Development of communities into areas already known to be prone to fires has increased the Forest Services resources to protecting these communities from fires (Moseley 2018). This causes an issue where other fires are left unchecked and unrestrained, as well as less resources to the proactive measures that can reduce wildfires. Additionally, due to a lack of funding and employees, the Forest Service has to outsource their fire suppression to private contractors (Moseley 2018), which reduces further their budget for working on maintaining controlled burns to properly manage the land. This in turn continues the cycle of poor or unideal land management and increases the risk of fires largely due to the impact of development into fire prone regions. Climate change, which is now accelerating as a result of human activity, comes along with increased global temperatures and decreased precipitation that affect the fire-prone forests in the Western U.S. California has warmed about 3 degrees over the last century, and precipitation decreases have lengthened the annual dry season (Borunda, 2018). Increasing temperatures as well as slightly declining and more variable precipitation have led to increases in wildfire size and frequency in the past half century, and in projections into the future using climate models. Human-driven climate change dries out forests through a combination of raised temperatures and less frequent, more variable precipitation (Borunda, 2018), exacerbating the risks of of large fires already posed by fuel build-ups resulting from fire suppression. Shockingly, 15 of the top 20 largest wildfires in California have happened since 2000 (Borunda, 2018). Although the frequency of fires in California today is actually lower than the in the past, the sizes of wildfires have increased tremendously, along with the area burned by wildfire every year (Borunda, 2018). Around half of the increases in wildfire burn area can be directly attributed to warming temperatures and more infrequent precipitation caused by human-driven climate change (Abatzoglou & Williams 2016, Union of Concerned Scientists, 2013). Human-driven climate change reduces soil and forest fuel moisture, making forests more susceptible to fire. Temperature increases and precipitation declines are also the predominant cause of the lengthening of the fire season in California. Higher temperatures increase the rate of evaporation and the melting of spring snowpack in mountain regions, which supplies moisture to Western forest ecosystems throughout the summer as it slowly melts. As temperatures have risen, more and more snow melts earlier in the season, leaving dead wood and litter to be exposed and dried out too early. The earlier melting of snowpack also decreases the amount of moisture available to the forest ecosystems later in the fire season, extending the season in both directions. At present, the fire season is 7 months long, 2 months longer than it was in 1970 (Union of Concerned Scientists, 2013). Climate change will certainly continue to increase it. In climate change models, Riley & Loehmann (2016) projected an increase of 12 days of moderate or high fire danger within the fire season by 2030. Climate change has definitely been tied to the increase in area burned by wildfires, and the size of those wildfires. A study published in the Proceedings of the National Academy of Sciences found that between 1984 and 2015 in the Western US, the effects of human-driven climate change increased the area burned by wildfire 200% of what it would have been without the effects of climate change, which is equal to adding the combined burned area of Connecticut and Massachusetts. (Abatzoglou & Williams 2016). Not surprisingly, climatic factors will continue to drive increases in area burned in the future, with one study projecting a 46% increase in burned area in around a quarter century (Riley & Loehmann 2016) and another study suggesting that the increase in a century could be as much as 116% contemporary levels once climate-driven vegetation shifts are considered as well. (Liu & Wimberly 2016). Climate change is contributing to the increase in the size of individual fires as well, which are projected to increase 7% in ~25 years from contemporary levels (Riley & Loehmann, 2016). Climate change is increasing the dryness of forests and decreasing moisture available in the air, soil, and fuels, all which increase the chances of large fires, the size of large fires, and the area burned by large fires. The symptoms of climate change in California are wreaking havoc, and must be acknowledged, addressed, and mitigated. Due to the research previously outlined, California has a dilemma that will only increase in gravity in the coming years. As of right now, the state uses a combination of tactics that include thinning, which is a common form of wildfire management implemented throughout the US. Thinning is broadly defined as “cuttings made in immature stands in order to stimulate the growth of trees that remain and to increase the total yield of useful material from a stand” (Smith, 1962). In the Western US, wildfire prevention was made such a priority in the past that many Western forests have fire deficits. Many forests in the West are now characterized by fuel accumulation to the point where if a fire does happen, it will be very intense and hard to contain. This is because the fuel load available for a fire is a huge determining factor of that fire’s intensity, which is simply a function of spread and amount of fuel available (Botelho & Fernandes, 2003). While the region as a whole is slightly wanting of fire, the areas where fire does burn, they burn with extreme intensity and severity, causing much more damage (Moseley, 2018). However, this method is detrimental to the environment in the long-term. By consistently suppressing smaller fires, the amount of natural fuels aggregate over time. As a result the occurrence of a larger scale fire, the potential for the blaze to become uncontainable is increased due to an abundance of fuels in the environment. This issue could be solved by what are known as prescribed fires, or controlled burns. These can be defined as “any fire intentionally ignited to meet specific land management objectives, such as to reduce flammable fuels, restore ecosystem health, recycle nutrients, or prepare an area for new trees or vegetation” (Daniel boone national forest). This tactic is not new to the United States. Native Americans have been said to use controlled burns for many reasons, including farming, restoring grasslands, and hunting strategies (Zierten, 2013). With the re-implementation of controlled burns, California could assuage many risk factors that have been contributing to large scale wildfires across the state. Prescribed burning has been shown to be effective at preventing or mitigating large. wildfires, especially combined with thinning and other management practices. Prichard, Peterson, & Jacobson (2010), in their research published in the Canadian Journal of Forestry, examined how differently a large fire affected lands that had undergone many different kinds of treatments in the preceding years. They found that in areas that had been only mechanically thinned, 19% of trees survived, in the control areas 14% survived, and in the areas that had been thinned as well as burned, 57% of trees survived. (Prichard et al, 2010). A research study also looked at how differently managed pieces of forest fared when subjected to the same fire, in this case the Rodeo-Chediski Fire in Arizona during 2002. They found that the areas that had received cutting and burning underwent the least severe fire, while the areas that were not treated in any way received the most severe fire (Yocom Kent et al, 2015). Burning supplemented by thinning generally is seen as the most effective combination in preventing severe wildfires (Arkle, Pilliod, & Welty, 2012). The reason for this is because burning alone may be effective in removing surface fuels (forest floor litter and shrubbery), but not in removing ladder fuels (which connect surface fuels to the canopy fuels). Thinning alone, on the other hand, is effective at removing ladder and canopy fuels, but is not effective at reducing surface fuels, and may even add to them. By combining the treatments, one is able to reduce all of the forest fuels from surface, ladder, to canopy. (Kalies & Kent, 2016). Controlled burns despite their benefits also have some aspects that communities may be strongly against. Similar to large scale fires that burn excessively, controlled burns can sometimes become too much to handle and break out into a full-scale wildfire. These fires can be too dangerous for a controlled burn team to handle and would require suppression teams to take care of, if it is possible. This also incurs the same dangers as uncontrolled wildfires, such as a controlled burn in the Colorado State Forest Service which burnt 1400 acres and destroyed 23 homes as discussed in L. Krantz, 2015. An additional concern of controlled burns is that they also produce smoke that poses a health concern same as typical wildfires (Delcourt). The smoke produced by fires is another source of worry for communities in proximity to controlled burning areas. Controlled burns however, rarely end up going out of control. As recorded by the National Park Service, during the 20 years prior to 2000 when controlled burns were used, only about 1% of 3,783 fires ended up spreading past pre-designed limits, reported in Controlled Burning, Out of Control (2000). It is also important to note that controlled burns have become safer and more regulated since 2000, and are only recommended during specific weather conditions and seasons to mitigate as many erroneous variables that may preclude an out of control burn (Delcourt). Using these mandated requirements for a controlled burn minimizes potential for fires to go out of designated areas, as well as excessive emissions of smoke and carbon dioxide (Delcourt). Smith, D.M. (1962). The practice of silviculture. New York: John Wiley. 578 p.
Liu Z, Wimberly MC. Direct and indirect effects of climate change on projected future fire regimes in the western united states. Sci Total Environ. (2016) ;542:65-75. http://silk.library.umass.edu/login?url=https://search.ebscohost.com/login.aspx?direct=true&db=edswsc&AN=000365602100007&site=eds-live&scope=site. doi: 10.1016/j.scitotenv.2015.10.093. 2018). Due to the increasing activity, size, intensity, and severity of wildfires and their associated costs in the Western U.S. and particularly California, a well-funded, rigorous regime of prescribed burning should be implemented at federal, state, and local levels in order to cull accumulated forest fuels, and thus decrease future wildfire severity and intensity.